Caramel is an intimidating thing to create. Usually when I need to whip up a batch, I make sure I have plenty of ingredients on hand for at least a second attempt, if not a third. Not being blessed with patience, my willingness to endure the process more than once speaks for the value of caramel itself. 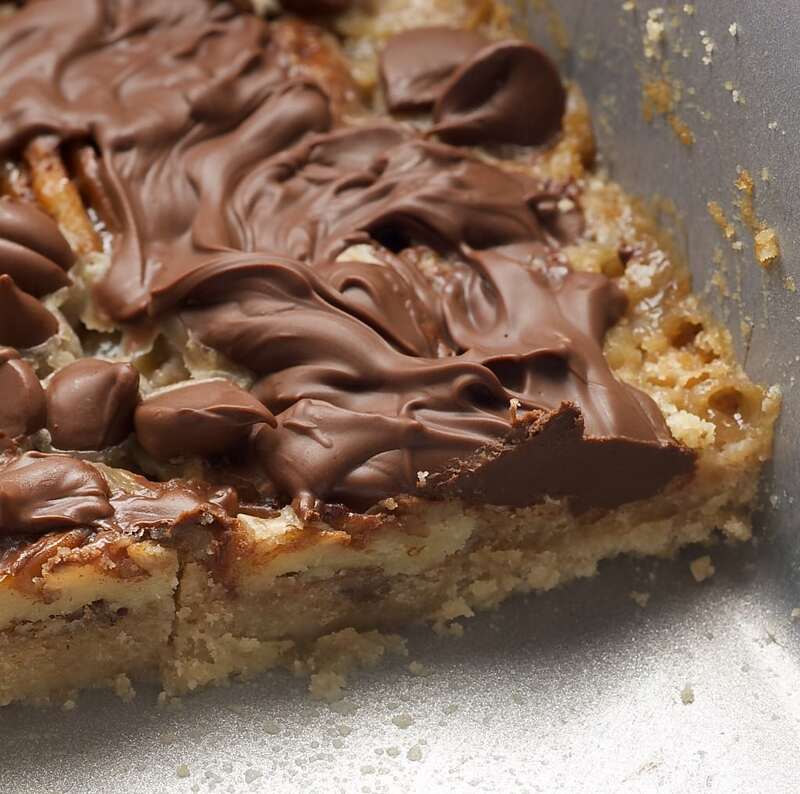 Everything about making these bars is simple, including the caramel layer. No candy thermometer necessary! How amazing is it that two simple ingredients like butter and sugar can turn into caramel in a matter of minutes? My fascination with caramel aside, there are other components of these bars worth mentioning. There’s the sweet, buttery crust. And pecans. (Hey, did you know that I like pecans?) Plus, there’s chocolate on top of all of this. Quinn and I really liked these. Maybe a little too much. They weren’t share-worthy. And I mean that in a good way. 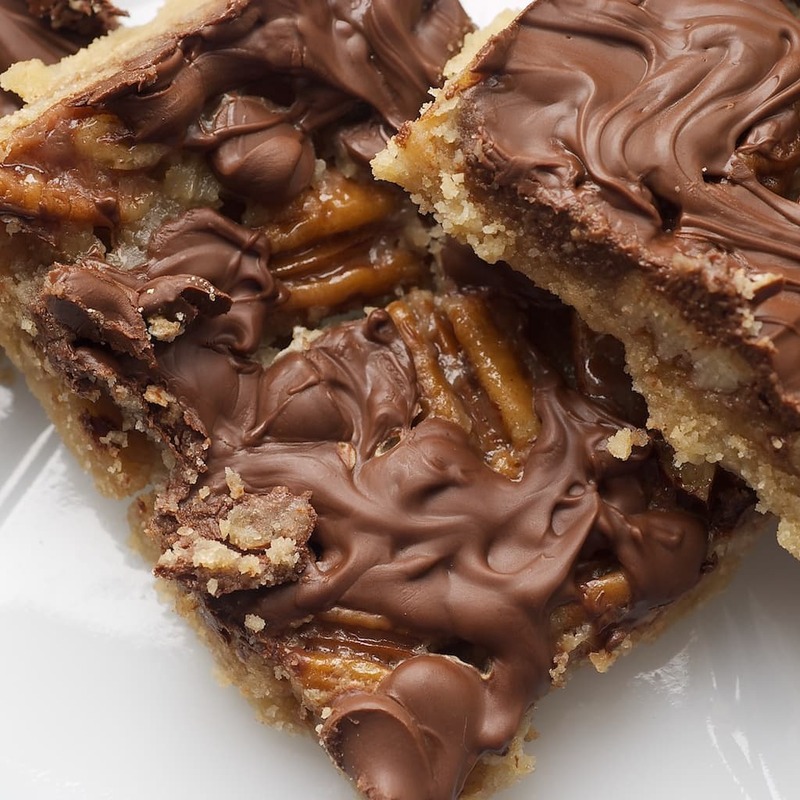 You only need a handful of ingredients to whip up these simple, delicious Caramel and Chocolate Pecan Bars. 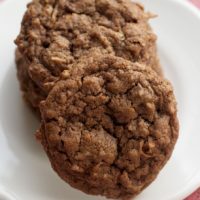 Combine the flour, brown sugar, and butter, beating at medium speed with an electric mixer until the mixture resembles fine crumbs. 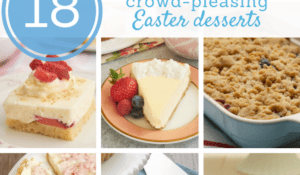 Press onto the bottom of an ungreased 9″x 13″x 2″ baking pan. Place the pecans evenly over the top of the crust. Combine the butter and brown sugar in 1-quart saucepan. Cook over medium heat, stirring constantly, until the mixture begins to boil. Continue stirring and allow the mixture to boil for 1 minute. Pour evenly over the crust and pecans. Bake 18-22 minutes, until the caramel layer is bubbly. Be sure not to overbake. Remove from the oven. Sprinkle with chocolate chips and allow to melt slightly. Swirl the chocolate chips over the crust. Cool completely before cutting into bars. I love pecans too!! These look scrumptious. I’m filing this in my stack of goodies to make for Thanksgiving and Christmas! Thanks!! Wow, these look great!! I am always intimidated by making caramel, my candy thermometer and I never seem to get along really well! I will have to try these!! Caramel is so simple to make. Take 2 or 3 unopened cans of sweetened condensed milk. R emove the paper labels. Put in crockpot. Fill crockpot with water just covering the top of the cans. On low heat for 5 to 6 hrs. I’m making this recipe in a few minutes so I wanted some tips. I need to respond to Bobbie, NEVER try to do this with sweetened condensed milk. It’s very dangerous and the cans even come with warnings on them now to stop people from doing this! Either use this recipe or buy caramels and melt them. I made this Land O’ Lakes recipe years ago but topped with milk chocolate chips….I think it is time to re-visit with a semi-sweet version…ideal holiday cookie plate goodie! I think I’ve found a new favorite recipe…What’s not to love about chocolate, caramel and pecans!!! I read this post at 9:30 this morning… by 11:15 they’re sitting cooling on the countertop. Had a moment of disaster when the butter/sugar mixture would not blend… but vigorous stirring and a break from the heat solved that. Just had 1st bite with hubby– WOW. Please take my advice and stop whatever you’re doing and make these RIGHT NOW. You’ll thank yourself. Gorgeous as always! It always brightens my day to see a new post on your blog! It’s like a dream come true! Love it. My mouth is agape. These photos… SCRUMPTIOUS! 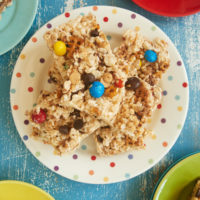 Seriously, like Mrs.F above, I am going to be making these ASAP! Thanks for sharing! These are absolutely amazing. Second time using this recipe within three days… during exam block. What a great site! These look so good that my mouth is watering……yum! these look gorgeous. can’t wait to try them! This is (minus the swirling of the chocolate) the English Toffee Bars recipe from the Hershey cookbook that I’ve been making for 20 years. IT IS THE MOST DANGEROUS RECIPE I MAKE… In that I will eat the entire batch by myself within two days. With the dishes you have here. I am sure to loose all my teeth in three years. I love all the sweet dishes here. Can’t wait to make these! How do they store? Room temp or in fridge? Thanks! NRS, room temperature should be fine. Jennifer, what brand semi-sweet chips do you like for these? Thanks! I almost always use Guittard, NRS. Made these tonight for a cookie exchange I hosted. I used margerine instead of butter for the topping, and I found it to me more fudge like in taste – not very caramely, do you think this is the butter vs marg? Or did I not boil the topping long enough? Hi, Tina. I have virtually no experience with baking with margarine, but I would feel confident in guessing that it made the difference. Honestly, I wouldn’t use margarine at all in baking. I’m a big believer in real butter! 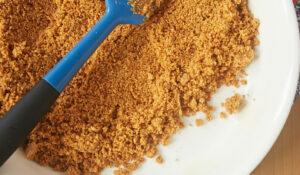 use dark or light brown sugar? Hi, Felicia. You can use whichever you prefer. I usually use light brown sugar. I just seen this share on Facebook; and after reading the recipe, I noticed I had all of the ingredients. Needless to say, my pecan bars are baking as we speak! Thanks for sharing! Will make these as soon as I buy some unsalted butter. That will be tomorrow! Looks wonderful. 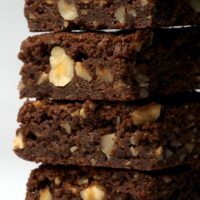 These are my favorite- one more addition that may make you swoon is sprinkle about 1/2 tsp of course ground sea salt over the top- voila salted carmel bars. Mmmmmmm. Help, I only have salted butter. Has anyone made it with salted butter? I want to try it but I don’t want to waste all the ingredients either and I can’t go to the store right now…. Maxine, salted butter is fine if you don’t mind your bars being saltier. I have a question? 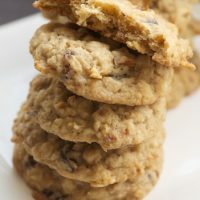 The recipe name Caramel and Chocolate pecan bars, Why is there not caramel ingredients in the recipe? 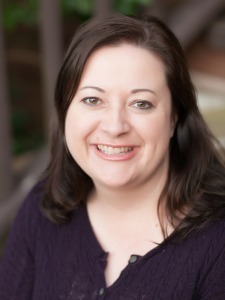 Linda. the butter and sugar becomes the caramel. Thanks for answering, Erma. She’s right, Linda. The caramel is made from cooking the butter and sugar on the stovetop. 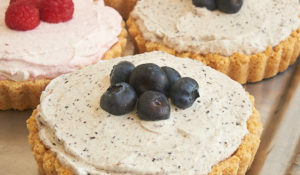 I make these but instead of mixing a bottom layer, I use graham crackers, then continue with same .. one of my favorites. This year for the holidays I broke up candy canes and added to the top also. Husband loves choc and mint together. Why unsalted butter? Unsalted butter in my opinion is a flavorless as margarine. I only use salted butter in all cooking for the flavor it adds. Just curious if this will make a difference. Laurie, I always bake with unsalted butter. There’s no standard for how much salt is in salted butter. Using unsalted butter lets me control the amount of salt in my baking. I save the salted butter for spreading on warm bread. I would use salted butter the next time. It lacked a little something. My boyfriend stumbled upon your recipe the other day. I made it once and now I’m hooked! Mine was not as good looking as you, but wow so good! Thanks for a really good recipe! Take care. OMGness, these look and sound devine! Will be stopping by the store on my way home from work so I can make them for a treat tonight and leftovers for people at work tomorrow. I’ll be sprinkling a little sea salt on top as well; love chocolate, caramel and sea salt. Thanks for sharing! I have a question. 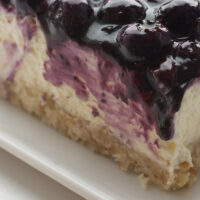 Do you bake the crust before adding the topping? No, the crust does not need to be baked separately. I made this recipe last night after seeing it on FB. I followed the recipe as written and baked 18 minutes. I have a similar recipe that uses saltines as a base. We are not major salt users, but on tasting this morning, I think this recipe NEEDS salted butter. It would definitely enhance the other flavors. I used a metal pan and spread the caramel layer to the edges before baking. I would not do this again since the caramel layer would more than likely spread to the edges as it bakes. It was VERY difficult to chisel the cooled bars on the edges out of the pan !I am going to try this again today using salted butter and a Pyrex dish and will report the results. I think it’s going to be delicious ! wow, my three fave things. Chocolate, caramel and pecans. And a fairly easy recipe. Ok, I’m convinced, I’ll try it. This is a good recipe and worked well, but there really is no caramel involved- That would involve the addition of cream or milk. The combination of butter and brown sugar produces toffee. That is why there is no gooey consistency that caramel would have. Ok not sure what im doing wrong but my crust will not blend and does NOT resemble fine bread crumbs!!!!! Do I need to sift the flour before measuring two cups? I think I would have had more crumbs for the crust and less sand in the pyrex baking dish. I think its gonna be OK as I shut and watch it cook. Thanks for the yummy treat!! Leslie, I didn’t sift the flour. You can if you’d like, but you’ll need to do that after you’ve measured it unless you’re weighing it. could you use the caramel for ice cream instead if you say it is tricky to make? Barbara, the caramel for these bars isn’t that difficult, as compared to making true caramel. I think a caramel sauce like you’d use for ice cream might not work well. I fear it would be too sticky and not set up well when it’s baked. So much good stuff going on in this bar! Even better with fresh butter! I made these yesterday…my family really didn’t care for them. The crust was dense and bland and like Patsy, we had trouble cutting them. They seemed to fall apart coming out of the pan. I might try them again, but I don’t think they’ll be a “family favorite”. What does adapted mean in context of a recipe? I don’t see the difference between this and the LOL linked recipe. I would love to post this recipe but don’t want to steal some companies recipe they worked hard to come up with. Thanks for any advice you can give me. Hi, Christine. That’s a good question! Adapted can mean anything from slightly altered to loosely based. For a recipe like this where the ingredients don’t really change, I normally say “slightly adapted” because I like to rewrite directions to how I did things or just how I like them to read to work best for my brain. (I have updated that here, as I have made my attribution standards more strict since this was first posted in 2011.) That way if there happens to be an error in the interpretation of the recipe here, it’s all mine and not implied to be an error by the original source. I hope that helps! I am not sure about the website. the fat, carbs and sugar. I found the most difficult part: “Cool completely” …. Just wondering, do you think there is something I could use in place of the pecans? My son has a tree nut allergy. Hi, Michelle. You can omit them or just use something else. I’ve not tried it, but I think a cereal might work. 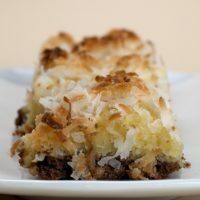 Do you think that coconut would be a good substitution for the pecans? Hi, Norma. Yes, I think that would work. Just keep an eye on it in the oven so that the coconut doesn’t get over-toasted. can you use Kraft caramel thinned with a bit of heavy cream and butter? Hi, Trish. I’ve not tried that myself with this recipe. That usually makes a thicker caramel, but you can add enough cream to make it a bit thinner. Curious if anyone has used pretzels either instead of the pecans (thinking salty sweet) or added them to the recipe? I’ve not, Susanne, but that sounds really good! Made these today. They were easy and they’re very good! My husband said to keep the recipe. Can you use Almond flour instead of traditional flour? Hi, Melissa. With a large amount of flour, usually substituting almond flour doesn’t work that well. Jennifer can you use margarine in this recipe or do you need butter? Christina, I don’t bake with margarine so I can’t tell you for certain that it will work. Usually it’s a straight 1 for 1 substitution, so I would try that. The water content varies between the two, so you may notice a difference in the wetness of the crust dough. I was out of butter so I used margarine…. I’ll let you know how it tastes! Can I use store-bought Mexican cajeta instead? Hi, Monica. What are you wanting to replace in the recipe? It will have a different consistency, and I don’t know if it will set the same way. It should still be tasty! 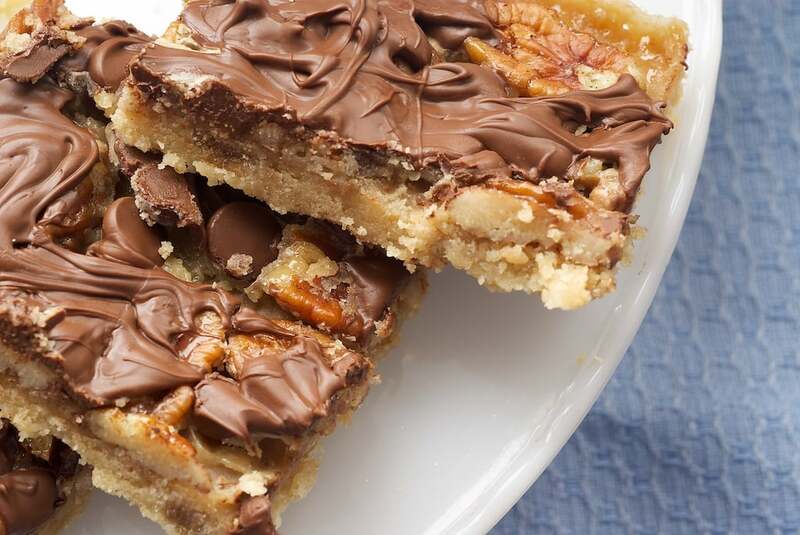 Can these caramel,choolate,pecan bars be frozen? Hi, Sandy. I’ve not tried freezing these, but I think it would be fine. I felt like I needed more of the caramel mixture – maybe because I like it so much – it didn’t completely cover the crust, or the pecans. It’s in the oven now, Dark chocolate chips & sea salt at the ready! Can’t wait to try it!